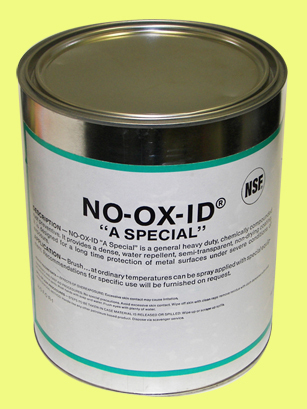 NO-OX-ID "A SPECIAL" is a soft, grease type rust preventive, which contains a solvent for ease of application. Designed for spray or brush application, NO-OX-ID "A SPECIAL" leaves a thick, semi-transparent, non-drying film, retains its properties indefinitely. Metal wetting agents and selected rust inhibitors blended with a petrolatum base make NO-OX-ID "A SPECIAL" an economical effective, protective coating. NO-OX-ID "A SPECIAL" is recommended as a general heavy-duty rust preventive whenever cold applied coating is required for maximum protection of metal from weathering, water, or any corrosive atmosphere, used virtually by every industry. In the manufacturing of precision or any finished metal parts, NO-OX-ID "A SPECIAL" serves as a protective coating during storage and shipment. For this purpose it is applied by brush. For application by hot dip method, use NO-OX-ID "A". NO-OX-ID "A SPECIAL" is used extensively of maintenance purposes. Whether the corrosion problem involves nuts and bolts, structural steel, steel water tanks, equipment in service or storage, patterns, dies, or jigs, NO-OX-ID "A SPECIAL" will provide complete protection with one coating. NO-OX-ID "A SPECIAL" is cold applied as it comes from the container using a stubby brush, swab, or glove. NO-OX-ID should be rubbed onto the surface thoroughly to absorb any moisture present and to insure contact over all irregularities present. A thicker film should be applied to areas exposed to severe corrosive influences. NO-OX-ID "A SPECIAL" can be sprayed in positive displacement heavy material pumps having an 8 to 1 piston ratio, such as, Graco, Alemite, Binks, De Vilbiss, or Lincoln, after warming NO-OX-ID "A SPECIAL" to 90F. This temperature is well beneath the flash point of NO-OX-ID "A SPECIAL".